Nouveau Paris Monumental Ininerarie Pratique de l'Entranger Dans Paris. And indeed it is, the tableau of modern punctuated, as with the monuments illustrated here, by its long and fascinating history as a center of commerce, education, arts, and culture. This map shows both the train and Metro lines throughout the city. It was issued in various editions from, roughly 1900 to 1937. Though most examples are undated, the state of development of the Paris Metro, particularly the extension of line 12 from Porte de Versailles to Mairie d'Issy, suggests that this map was printed in 1934. The map is attached to original red paper booklet. 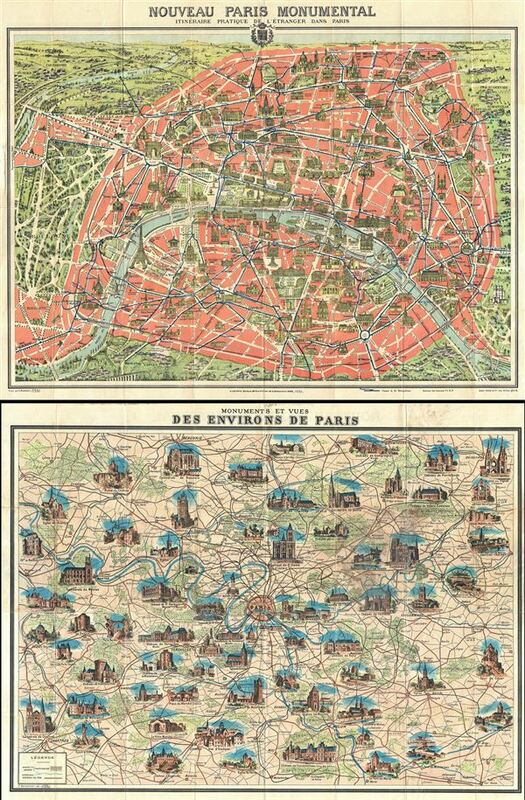 A similar map of the greater Paris environs appears on the verso. Engraved by L. Poulmarie and printed by Gaston Maillet. Published by A. Leconte, of 38 Rue St. Croix de la Bretonnerie, Paris. Leconte, A., Plan Monumental Paris and Environs Itineraire Metropolitan, (Paris), 1934. Very good. Minor wear along original fold lines. Map of Greater Paris Vicinity on verso. Accompanied by 12 page booklet. Dated added in manuscript on booklet and map is incorrect. Printed maps on both recto and verso.